From birth to about two years of age, your child will undergo a period of change and development known as the sensorimotor stage. As he grows into a little explorer with little to no notion of fear and safety, you’d definitely want to create a safe play space for them, while allowing them to engage in play learning to explore and develop. Here are some ideas on how you can do so. At this stage, as your child will be responding to external stimuli, providing an environment that allows him to exercise his senses would be beneficial for further growth. 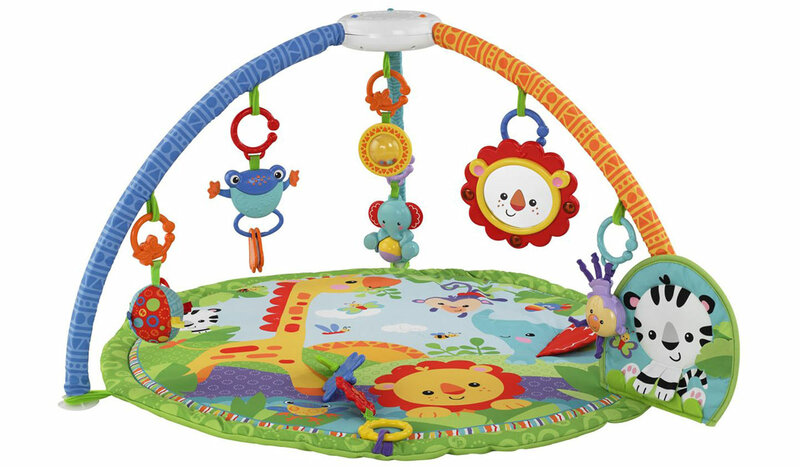 A musical gym that comes with lights, music and other activities and toys allows your baby to interact with a stimulating play environment. By the time your child can sit and crawl unassisted, it’s time to change his play environment a little to help him strengthen his motor skills. It also helps them get used to playing and exploring without you around all the time. As your child grows in confidence and is able to crawl or walk, he would definitely require a bigger area to move and tumble about. If you have the space for this outside the home, set it up outdoors instead so that your child stays away from that iPad game he’s been playing for hours and engage him real life psychomotor learning under the sun. MAKE IT FUN, MAKE IT CREATIVE! Buy toys that stimulate multiple senses. Rattles and music boxes are great in engaging the hearing, while the use of toys made of different materials provides discovery of texture and temperature differences. Use blocks to allow your child to exercise creativity in making and building. Once they are old enough to know not to put everything they see into their mouths, you could even start them working on play dough or clay. For play yards that have gates or openings, ensure that they are not easily opened by your child. If they contain gaps, ensure that they are not big enough for your child to stick his head through…or any other parts of themselves like their fingers or limbs. That would create more trouble than necessary! Bars should ideally be 50-95mm apart. Take note of the size of the toys you include in the play area – make sure there are no parts that are small enough to be swallowed or inhaled. For indoor play yards, lining the floor of the area with foam play mats would be a good idea to allow your child to tumble about without hurting themselves. Ensure that playpens and play yards are sturdy – your child would definitely try to pull themselves into standing positions. Position playpens and play yards away from power points, curtains, windows and cords. When renting or buying secondhand furniture, make sure to check for all of the above. Check that nuts and bolts are tight. This is an extension of an article found in Singapore’s Child magazine Issue 178, titled “Putting Together the Ultimate Kids Playroom”, written by Anton D. Javier. What are some tips you might have for other parents setting up a playroom in the home?